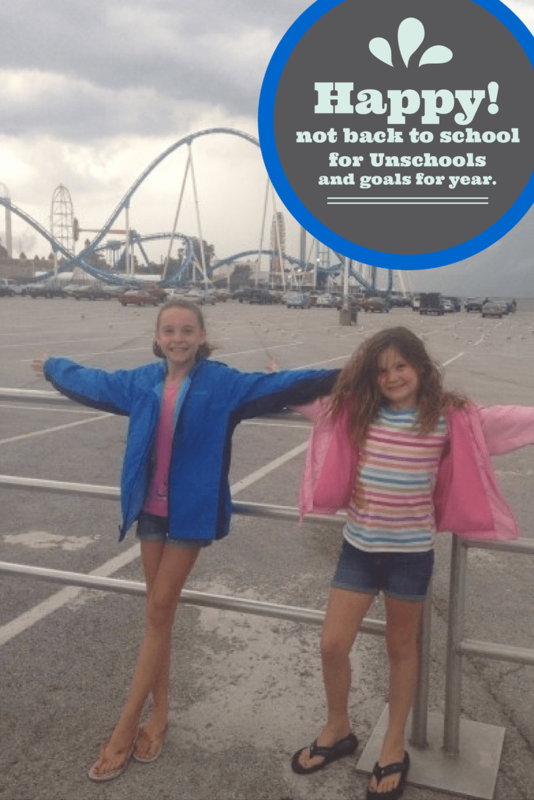 Happy not back to School Day for Unschoolers and goals for the year. We will not be going back to brick and mortar school where we get to sit in our desks for eight hours. They will not take a bus ride that picks us up at the crack of dawn. We will not be taking tests, doing workbook sheets, following any common core and no homework. The kids will be Unschooling again for the 5th year in a row, having fun LEARNING (yes learning). We will be traveling across the US in our 5th wheel and (hopefully) Canada. The girls will learn geography as we help our dad navigate the roads. Visiting lots of science and technology museums, historical sites, national parks, zoos, and aquariums. We will read about them in books because we want to, not because some guy from Common Core land told me I had to. They might just read for fun, or google it. We actually did something a little different this year, we set goals for ourselves every month. The plan is to accomplish these goals and if we succeed we get a reward. So here is our plan for the year, now keep in mind this may change tomorrow, next week or even half way through the year. Heck, we might forget the whole thing and do something completely different…..
Read (audio books) all the Percy Jackson books and watch the movies. We will discuss mythology in great detail and the differences in the movies and books. Read (audio books) the last book of Harry Potter, Oz Family Collection, Kingdom Keepers. We will also read and listen books on the library app, Overdrive, and booksshouldbefree.com. We will also do some edible science experiment, science museums, mythology, geography, economics, writing, history, and what ever else we find that sounds like fun! Learn how to mod in Minecraft. We will be trying out a new beta version and learning how to program using Learn to Mod and getting college credit, but I will be talking more about that on Wednesday!! Mini rewards for each week are 30-minute movie download onto our iPads. Munchy reward if she accomplishes her goal for the week is a movie at a movie theater with popcorn, candy, and drinks, or horse back riding. Huggs reward is to go to an amusement park, water park or something like that, skating at a skating ring, or Eating out (like Dairy Queen). This entry was posted in Art/Music, History, Math, science, Unschooling, Unschooling FAQ and tagged economics, geography, goals, History, mythology, science, Unschooling FAQ, year plan by Chrissie. Bookmark the permalink.